UK angler Kevin from Powys in Wales started his Thailand fishing holiday stingray fishing at the Maeklong River in Thailand. The angler began fishing for stingrays on a wide section of the river with small native live baits positioned at intervals across the tidal river. After only an hour or so of fishing one of the floats burst into life, and the angler was soon bent into the first fish of the trip. From the onset of the battle it was clear that the Giant freshwater stingray was a very large fish as it towed the boat downstream on several occasions. 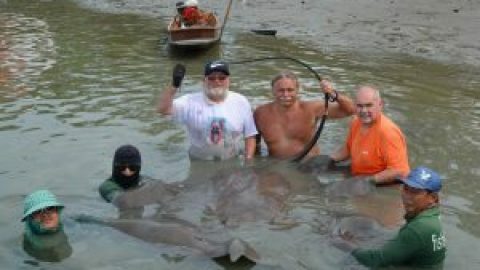 After clamping onto the riverbed on several occasions the Giant freshwater stingray was finally brought off the bottom before being brought over the waiting net. 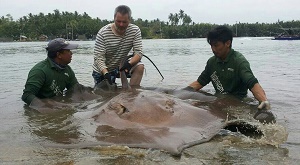 The Giant freshwater stingray was quickly transported to the riverside where it was identified as being a pregnant female with a width of just over 2 metres. An estimation of approximately 230-240kg’s was placed on the stingray before it was carefully released back into the tidal river.